As in all things, however, there is a group that the RV kitchen Layout doesn't really matter. There are some RV'ers that belong to the "LEO" club - "Let's Eat Out"! More power to them, if they can afford that! The "LEO" club member doesn't really care too much about the kitchen - just that the Living Room is good for entertaining! 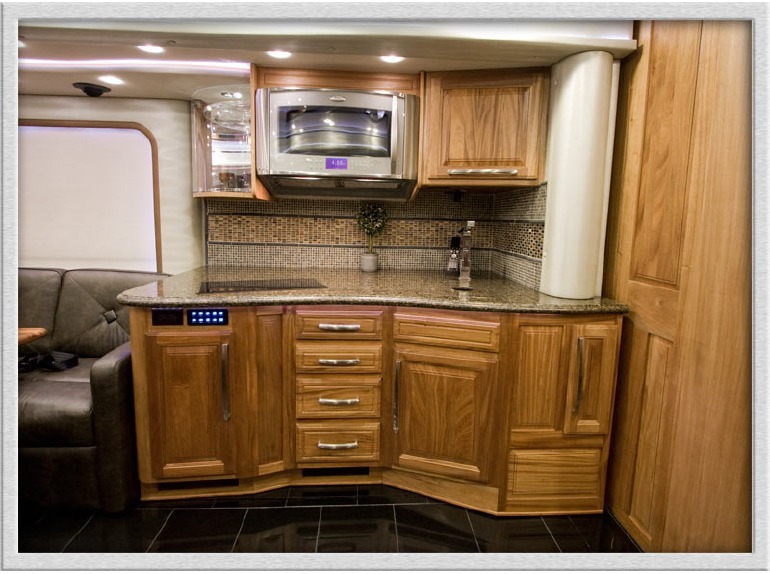 However, for the Fulltime RV traveler, the different Kitchen Designs play a very important role. The typical recreational vehicle floor plan of today, from a small Class B to a huge 5th wheel, is focused more so on the entertainment aspect. Many of today's newer RV's will have a beautiful entertainment area dedicated to lots of large sofas, giant TV's, etc. Now - There's some REAL counter space!! Notice the double sink - it's on an angle so you can stand up straight while reaching into the sink. The stove is a 3 burner on the other end of the counter. Then - in-between all that - is a magnificent L-O-N-G counter - with a HUGE window to add light and look out; plus, full-sized cabinets - no slide to reduce the storage! Try to find all that counter space and a large window in a new RV - impossible!! The RV designers must only eat out - it's obvious they've never actually cooked in RV kitchens! The advent of slides started the downfall of a useful kitchen. 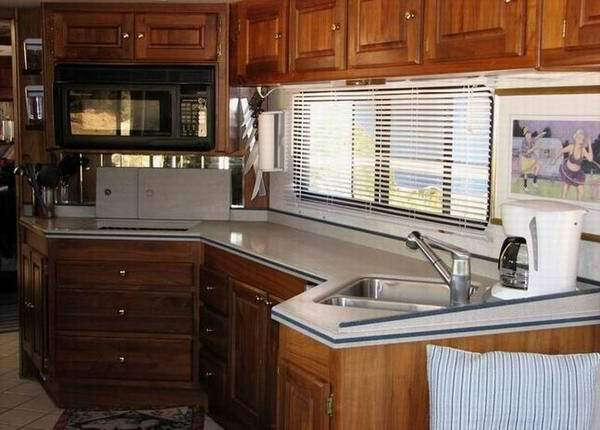 If you happen to see inside a RV that doesn't have a slide in the kitchen area, you'll immediately notice the kitchen layout will be much more kitchen oriented. It will have lots of storage - above, below and across; the sink will be larger and functional - perhaps on a slight angle - so the person can stand straight and still see out a LARGER window. It will have at least 3 usable burners that will allow multiple pots cooking at the same time. Best of all, it will have actual real counter top area! Even if you are more an entertainer than a "cooker", counter top space is critical! Course, if you use only paper plates and cups, dish washing isn't as important - unfortunately, that contradicts trying to live a RV Green Lifestyle!! No matter what your preference - cooking, entertaining or eating out, a RV kitchen should be able to handle your needs and demands! Search for the RV that has your needs in mind! Don't just look at all the beautiful "fluff" in most RV kitchens - and they all certainly have that! Be sure that kitchen design really is - "You"!! Pause - take a serious look at this "kitchen"! The kitchen pictured here, on the right, is from a "high-end" Class A Diesel. It is selling for over $600,000! Take a serious look at the actual functionality of the kitchen. It has a sink on the right - no counter to it's right. The Stove top is to the left. Approximately 12 INCHES of "Counter" - Wow - I could really cook a meal here!!?! But, if you are cooking - as you sometimes do in a kitchen, there is only about 12 - 18" of counter top between the sinks and stove top!! You sure better belong to the L.E.O. Club!! A recreational vehicle floor plan of today will have absolute minimal counter space, perhaps only 2 small burners, minimal storage and worst of all, the sink will be smaller and perhaps under an overhead cabinet. I watched a person trying to wash dishes with her head tilted to the side so she could stand over the sink, while washing dishes. I was getting a kink in my neck, just watching her! Oh, by the way - Drink Coffee?? Save yourself some serious grief! Get the BASIC Mr Coffee Maker. We found out the hard way that the "fancy multi-buttoned" coffee makers don't like voltage fluctuations of older converters and inverters - they kinda let all the smoke out of the coffee maker box! The basic model is the best - unless you are in a park all the time!